You can look at the U.S. unemployment rate in two ways. No. 1, thank heavens it hasn’t gone up. No. 2, holy smokes, it hasn’t gone down either! It stood at 8.9 percent in February, barely changing over January’s 9 percent. Despite economic growth, competition for jobs is as tough as ever, because this continues to be largely a jobless recovery. But it won’t last forever. Analysts are increasingly saying that companies are reaching the limits of how much work they can pile on employees. They’re approaching the max of employee productivity. The time for hiring is likely just around the bend. If you believe you need to strike while the iron is hot, here’s a head’s up for you: The iron is hot! It’s important to soak up good job searching advice and hone your interview skills now. 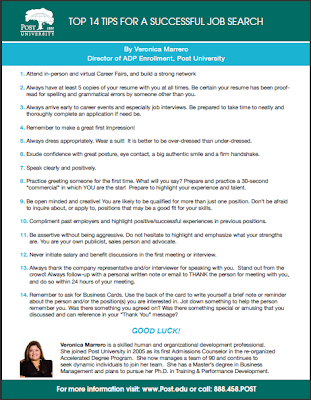 Post University has put together 14 tips to help you in your job search. Feel free to read them over online, share them with friends and family, or print out the document and post it on your fridge or somewhere you’ll always look to be reminded of them. For more help in your job search, don’t forgot Post University Career Services is available to every one of our students. For more information on how we can help you find and get the job you want, see the Career Services page on our website. Terrific tips Veronica! As the job market becomes more and more competitive, tips like these can certainly better arm job seekers for true success in the employment sector. Networking is also key in the job search process. Sites like Facebook and Twitter are very valuable to find job openings. And most of all, never give up, the career of everyone's dreams is just around the corner! One suggestion that I would add is to prepare an individual cover letter tailored to every single job to which you apply. Employers can always tell the difference between a form letter and one that was written just for their position.